Register now: How’s My Feedback? – A One-Day International Conference at Oxford | How's My Feedback? Registration is now open for How’s My Feedback? – The Technology and Politics of Evaluation, a one-day international conference at the Institute for Science, Innovation and Society, Oxford University. There is hardly anything these days that is not being evaluated on the web. Books, dishwashers, lawyers, teachers, health services, ex-boyfriends, haircuts, prostitutes and websites are just some examples targeted by novel review, rating and ranking schemes. Used in an increasing number of areas, these schemes facilitate public assessment by soliciting and aggregating feedback and distributing it as comments, ranks, scales and stories. While some have greeted this development as an innovative way of fostering transparency, accountability and public engagement, others have criticized the forced exposure and alleged lack of accuracy and legitimacy, pointing to the potentially devastating consequences of negative evaluations. Now research is under way to tackle these issues head-on and evaluate the various types of review, rating and ranking schemes in a collaborative design experiment. Under the title ‘How’s my feedback?’, a group of experts, including designers, managers, reviewers, policy-makers, consumer spokespeople, academics and users are currently exploring the idea of a website that allows users to publicly assess their experience with review and rating schemes – a feedback website for feedback websites. The goal of the conference is to reflect on this process and the emerging prototype. How are we to judge the effectiveness of these schemes? What modes of governance are implicated in their operation? What strategies and methodologies are employed in their development, maintenance and use? How successful is this project as a design intervention? 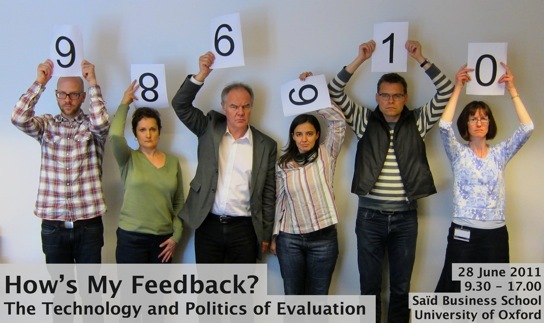 What is it to evaluate the evaluators – and will this business ever end? For more information, contact insisevents@sbs.ox.ac.uk. The conference is generously supported by an ESRC Knowledge Exchange Small Grant and the Institute for Science, Innovation and Society. UPDATE 27/5/2011: We just moved registration to a new site. If you already registered, no worries. You are still signed up. With the EC Directive on ePrivacy due to have come into force on 25 May 2011 in the UK at least, enshrining the right to opt out of any such electronic aggregation together with a number of related rights, shame on Oxford ! But who’s to tell them ? Thanks for your note! You are absolutely right about the registration form, which was the ‘official’ one provided by our department. It’s clumsy at best and makes us look pretty stupid. Apologies for that, we should have checked before. While there may be concerns about this solution, too, it at least lets us configure the form. All we really need for registration is a name, an organisation/affiliation (for your badge at the conference) and an e-mail address. If you had already registered with the old link, we moved you to the new page with name/organisation/e-mail only. Many thanks again for pointing this out. Feel free to e-mail us with any other feedback at info@howsmyfeedback.org.